NIME Medical PG Entrance Coaching Institute is set up at Sector 34-A, Chandigarh. 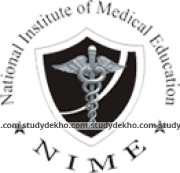 At NIME we prepare students to Crack Medical PG exams by imparting education and serving the MBBS doctor professionals, who are aspiring for MD/MS and MDS PG Entrance Exams Classroom coaching, Online Test series, Test and discussion series. We are having the best classroom coaching. The institute helps the students to prepare for the most coveted exams. Considering the significance of these exams, the institute provides its students with dedicated faculty, best course content and proper study guide. The faculty pay proper attention towards each and every child and prepares best course material to make them understand those questions that are to be attempted and those not to be. The point of this institute is to build up an aggressive state of mind alongside scholarly base which is driven by quality educating and in addition singular consideration. The consistent criticism framework and routine tests is an awesome method to guarantee that understudies can move in the direction of enhancing their shortcoming and at a similar point, center around their qualities. Weekly Tests are held, to add up to up and reconsider the whole information ingested in the week. It holds each understudy inside legitimate cut off points to see whether he/she is meeting the pace with the instructing plan.